SPARKSTER has developed the world's fastest decentralized CLOUD for smart software; basically a blockchain intended to replace cloud computing with a mission to break down the two important barriers constituting a major hurdles for the adoption of mass blockchain that areaccissibility and scalability. SPARKSTER is a decentralized platform that aims to democratize the application development process by improving functional software skills for users. With a large number of companies exploring the possible benefits of these decentralized applications, Sparkster hopes that Their vision of democratizing access to software innovation will help users translate their ideas into reality. This is in line with Sparkster's vision of providing software skills and tools to customers who want to leap forward by creating their first decentralized applications. Sparkster hoped that the following functions will help to cultivate the process of creating applications among many others. Sparkster is building the world’s fastest Decentralized Cloud for Smart Software. A specialized Blockchain designed specifically to replace Cloud Computing and execute tens of millions of transactions per second. By enabling you to build Smart Software in plain English, we empower you to create the future. we’re building the world’s fastest Decentralized Cloud that enables people to execute this software across a network of our community’s cell phones. This combined packaged is not only the cheapest, most democratic and fastest way to build software, but to run software too. A high performance decentralized cloud, as proposed by Sparkster, is necessary to mainstream blockchain adoption. Ideas are the currency of the future. We envision a future in which everybody can bring their ideas to reality. In doing so, they create financial independence for themselves, while contributing to their society in the process. The aim is to empower the dreamer within each of us to innovate. We will achieve this by democratizing access to the tools necessary for innovation in the 21st century: software development. Anyone can build a smart Software without prior experience. It's very fast and reliable. Made up of industry Veterans team with vast experience in blockchain technology and engineering. Project has a lot of use cases. Sparkster offers a platform where users can build an app within minutes. On the platform, a creation of an app does not require much skill which means that anyone who has interest in owning an app can do so without any hindrance. This revolutionized the way of creating an app is cost effective and can be done in simple English terms. On borders can build all types of apps ranging from business applications that create new and advanced business experience to IoT applications that enable smooth interactions with the real world. All these are done without a code. Sparkster platform also allows users to build smart contracts while also empowering knowledge workers to do more. All smart contracts will be made transparent, accessible and secure. Sparkster platform will give users rapid connection and control over their projects anywhere they are - using any device whether smartphones or laptops. The platform will rejuvenate and bring to life the connected world - the kick - starter innovations, complex business and industrial applications. Sparkster will make all the developments visual and intuitively responsive. All a user has to do is drag and drop while connecting building blocks and a softer will be generated instantly. Privacy – all data stored and accessed is deconstructed into transaction fragments, encrypted and disseminated across a network of nodes such that it cannot be of any meaningful value when viewed on a public ledger. Performance – transaction latency must be comparable with traditional centralized cloud computing, but transaction throughput must exceed Tens of Millions of Transactions per Second. Security – any devices operating on the network and interacting with client data are hardened such that any form of tampering to access data, while it is being processed, prevents the device from accessing the network. Architecture Transparent – Software designed in such environment must easily and automatically operate in a Decentralized environment, without requiring any knowledge or architectural design considerations for Decentralized environments by the software author. The Sparkster Platform enables you to build software without writing any code, by simply dragging and dropping blocks that are in plain English. Software generated by the Sparkster Platform is architecturally independent, meaning that software generated by the Sparkster Platform can be compatible with the architecture of the Sparkster Decentralized Cloud. 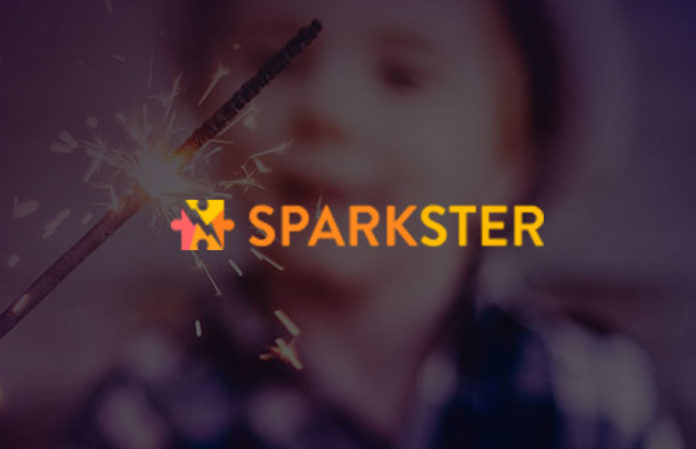 The token of the Sparkster platform is the SPARK which will enable consumers to reward authors for their work and allow authors to contribute to the Sparkster marketplace. SPARK will be released through the Ethereum network and will be of the standard ERC20 tokens. Anyone can purchase the tokens except US citizens. All purchasers must complete the KYC and AML verifications. Purchasing of SPARK can be done using an equivalent amount of Ethereum (ETH). SPARK is an ERC20 utility token built on Ethereum blockchain with the total supply of 435,000,000. Launched Sparkster Marketplace and filed patent application.